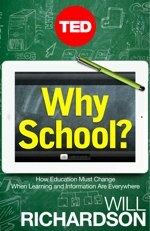 Excerpted from Will Richardson's new TED Book Why School: How Education Must Change When Learning and Information Are Everywhere. Richardson offers provocative alternatives to the existing education system, questioning everything from standardized assessments to the role of the teacher. In this chapter, "Real Work for Real Audiences," Richardson envisions students creating work that is relevant and useful in the world outside school. So what if we were to say that, starting this year, even with our children in K– 5, at least half of the time they spend on schoolwork must be on stuff that can’t end up in a folder we put away? That the reason they’re doing their schoolwork isn’t just for a grade or for it to be pinned up in the hallway? It should be because their work is something they create on their own, or with others, that has real value in the real world. I’m not even necessarily talking about doing something with technology. (Let’s face it, though: Paper is a 20th-century staple that has severely limited potential, compared to digital spaces.) There’s lots of creating our kids can do with traditional tools that can serve a real audience. Publishing books, putting on plays, and doing community service are just a few examples. Our students are capable of doing authentic work that adds to the abundance in ways that can make the world a better, richer place. Or, rather than having our students do that science lab write-up on the tadpoles in the pond behind their school, what if we rounded up a bunch of schools with ponds and tadpoles from all over the world, and then we all shared our data and observations with each other, analyzing how the differences in climate and geography affected native habitats? What if then published this global analysis online? Or, instead of reading scenes from Romeo and Juliet to one another in the classroom, students could put on an interpretive performance, one we then broadcast through a password-protected live stream to parents and aunts and uncles and friends online, posting it also as a video on YouTube. Maybe we could even run a competition with other schools to see who could come up with the most profound or creative way of bringing the themes of Shakespeare into the modern world. I don’t know about you, but as a parent, I’d much rather see this kind of work than the paper that comes home in the Friday Folder (or the Friday backpack). I’d rather know that my kids were creating something of meaning, value, and I hope, beauty for people other than just their teachers, and that those creations had the opportunity to live in the world. That they were thinking hard about audience. That they were learning how to network and collaborate with others. That they were developing “proficiency with the tools of technology,” learning to “design and share information for global communities to meet a variety of purposes,” and becoming literate in the process. Real work for real audiences is, of course, hard to find in the current standardized testing regime. How do you evaluate the San Diego Bay book project using a short-answer test? To assess this kind of work, teachers could co-create rubrics with students that identify what their work should address and what quality looks like. In this chapter’s examples, assessment might mean collecting targeted feedback from whatever audience might be watching that Romeo and Juliet performance or listening to those Vietnam veteran podcasts. And, importantly, it might mean having students engage in some deep self-assessment on their process and product, an experience that would certainly prepare them to be better learners when they leave us. Our students are capable of doing authentic work that adds to the abundance in ways that can make the world a better, richer place. Why wouldn’t we want to know they could do that?